Growing up in the United States, it was all about putting cucumbers on your eyes to decrease puffiness and soothe tired eyes. We love that eye patches now exist to solve a plethora of beauty problems: tightening the skin, moisturizing, decreasing puffiness, decreasing fine lines and so much more! What’s even better about most of our selected best Korean eye patches is that most of them stick on so well that you can walk around and work and do errands at the same time. You can use them as a complement to your favorite Korean eye cream. 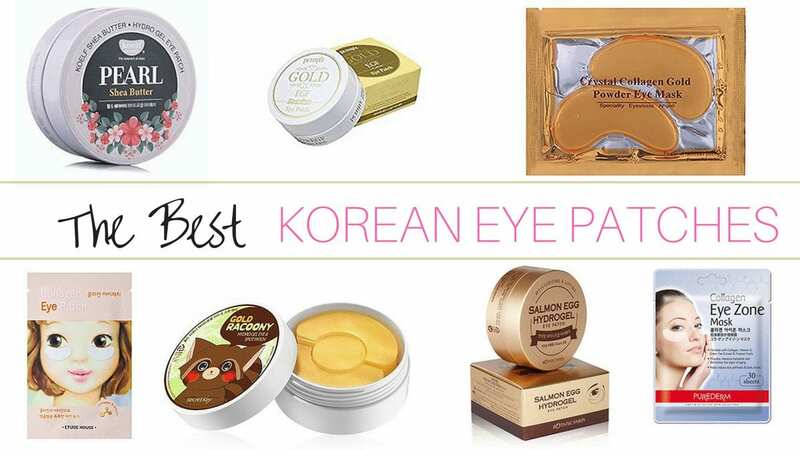 We’ve put all the best Korean Eye Patches to the test and are here to report back to you about the best! 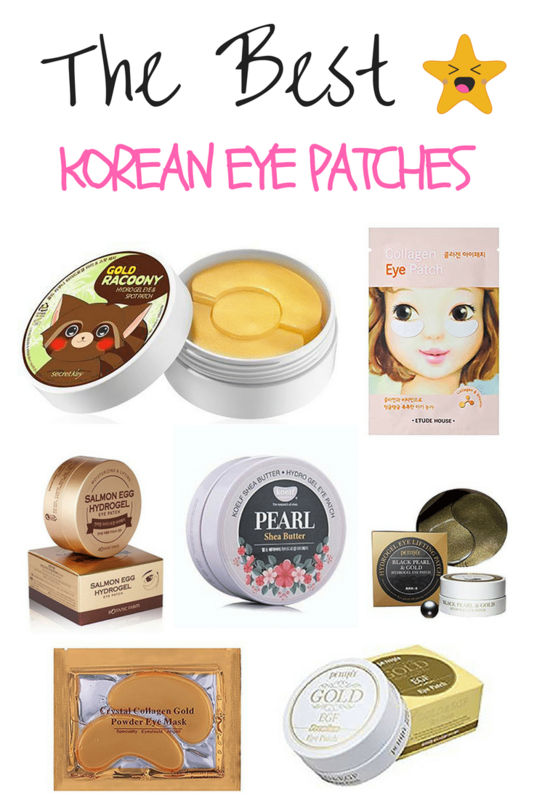 Here are top picks for the Best Korean Eye Patches on the market! If you have fine wrinkles that you need to get rid of asap this product is for you. It is 100% collagen and minerals and will speed up cell and collagen rejuvenation. Not only will it moisturize and relieve puffiness it will increase elasticity. These will work great for people who are staring at the computer 24/7, those who can not sleep, smokers, those with bad diets, and general eye fatigue. I really love the fact that this eye mask comes separately in packages; this keeps it from contamination since I’m an OCD freak! There is nothing too special about the packaging but I do like the simplicity of it. The patches are made of a gel material and firm therefore when I put them on they do not fall off. Unlike other products I have used before, these under eye patches stay on and I can feel them working instantly. I have sensitive skin so I’m very careful about what I put on my body. Many times when I put masks on, my skin is so irritated and itchy, but these are one of the products that left my skin cool and rejuvenated. Because they are individually packed, it is very simple to put them on. In addition, there is no mess because you can just throw away the package when done. 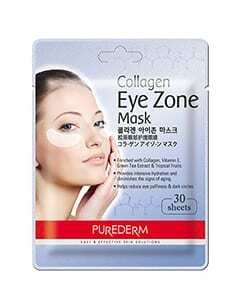 Etude House’s Collagen Eye Patch was made to hydrate and give elasticity of the skin under your eyes. It is supposed to lighten the bags under your eyes as well as brighten the skin from the collagen. 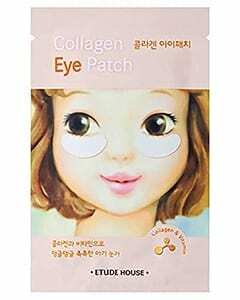 In addition, this patch is different from the gel eye patches that usually are thicker. Like most any Korean products, the packaging is absolutely adorable. The illustration on the packaging is so cute, I just want to frame it! Instead of getting 30 pieces in a container, this product comes in one pair for one use. I actually like this more because I can use this product once and throw it away; it seems a bit cleaner and easier to use. I normally am not into heavy fragrances and this barely has a scent. This Korean eye patch is lighter and thinner than others; although it stayed on my face the ends of it would fold over a bit. It didn’t stay on very well, but I did like how light and soft it was. Although it did brighten up my under eye circles for about half a day they came right back. This eye patch is something you can use temporarily but is not a permanent solution for fine lines or dark circles. Filled with collagen, green tea, tropical fruits, tropical fruits, and vitamin E., his product aids in reducing dark circles, uneven skin tone, and puffiness in the eyes. There are a total of 30 patches for a bargain price! Although this product is super cheap, the packaging is probably why. Most other eye patches that contain 30 pieces come in a container but this product comes in a flat foil package. If I saw this packaging at a store it would NOT catch my eye, and I would probably pass by it. The product itself works pretty well , but the packaging is something that needs A LOT of work. I love how the patch clings to your skin and does not fall off. The longer I have this eye patch on the better the effects were. If you have the time to leave it on for about 30 minutes, every other day, the effects are exponentially greater. This hydrogel includes premium ingredients such as snail, salmon egg, seaweed extract, aloe vera and colloidal gold. With such rich, ingredients this patch gives the sensitive part of your skin elasticity and prevents damage by the environment. 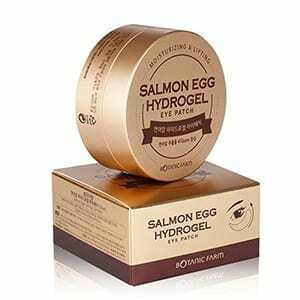 The Botanic Farm – Salmon Egg Hydrogel Eyepatch is one of the very few items that have erased my fine lines permanently. I’ve tried many eye patches and although they work for the first few days, the salmon egg hydrogel patch is permanent! I was a bit afraid to try something that had salmon eggs, but I went with it anyway. To my surprise it had a light citrus aroma in which I absolutely loved! Although the name of this eyepatch may seem a bit awkward, the product does not reflect the name. 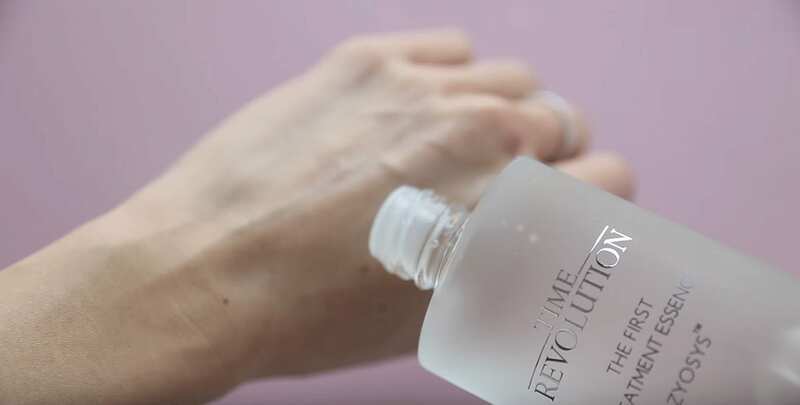 The eyepatch has a light, refreshing smell and does its job; I no longer have fine lines, dark circles and I finally feel refreshed and invigorated! 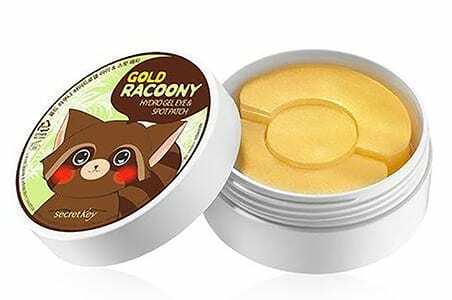 If you want to feel super refreshed & moisturized at an affordable price you have to check out Secretkey’s- Gold Racoony Hydro Gel Eye & Spot Patch . You get 90 eye patches (or 45 pairs) that will add hydration under your eyes as well as moderating dark circles. It also helps to eliminate blemishes on your face, yay! When I first received the Pearl Shea Butter Hydro Gel, I thought the packaging was super cute. They have an animated raccoon on top of the plastic circular container, but at the same time, I thought it looked a little cheap. I really did like how they fit the mini spatula in the plastic container which was also a great design choice. When you open up the container, the patches have a yellow/gold tint with a bunch of glitter which I LOVE! The only other problem I had with this was the fact that the patches were a bit thin and couldn’t separate them very quickly. On the other hand, what separates this product from the others is that it has a circular strip in the middle for your blemishes. While you are working on your eyes you can kill two birds with one stone by treating your pimples as well. What a great way to use all the space in packaging! Although it doesn’t get rid of zits, it does fade away dark spot on your face. This product does what it’s supposed to do; it refreshes, cools, takes the puffiness away, softens and tightens the skin around your eyes. If you want a quick cheap facial, targeted just for your eyes, then the Koelf – Pearl Shea Butter Hydrogel Eye Patch is the perfect solution. This product includes 60 patches (which you can use for about two months.) This hydrogel eye patch was created to get rid of puffiness around the eyes, enhance firmness, eliminate fine lines/dark circles and increases the skin’s elasticity giving you a healthy, beautiful glow. This eye patch contains Shea butter in order to rejuvenate and hydrate dry skin around the eyes and the pearl powder is filled with minerals and amino acids. I’m a sucker for packaging and I absolutely love how they packaged this product. It comes in a lavender circular container and the design is clean, cute, simple and straight to the point. I found their motto “the eyepatch for elves,” a little odd and didn’t fully understand what it meant, but the product is the most important thing, right? The patches are stacked on top of each other with an essence that smells like lavenders. I really love how moisturized and saturated these eye patches were, every time I would put one on I would get the full effect. Because the small size of these patches they tend to roll up at the edges and dry out. I can sit up and walk around without the patches falling off which another great plus. Unlike many other eyepatches I have used, this hydrogel does not leave a residue after I take it off. There is no flakey mess that I have to clean off. It was also very interesting to see how the eyepatch would get thinner as time went by. I could actually see that the product was actually working! I had pretty quick results, the puffiness around my eyes went away almost instantly My eyes felt rejuvenated making me feel refreshed and less tired. 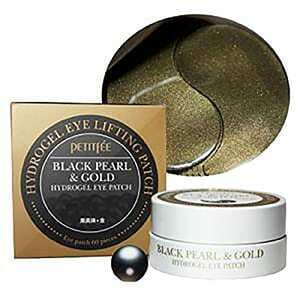 The Black Pearl and Gold Hydrogel Eyepatch is a gel eye patch that hydrates and is made with black pearl and gold. The black pearl has high levels of minerals and amino acids. 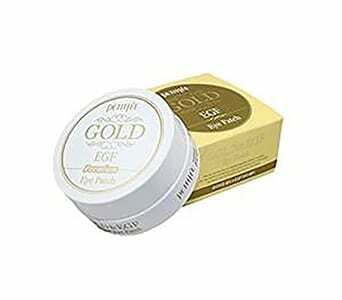 The gold particles help to keep your skin rejuvenated as well as purifying it. This product is made from many vitamins and nutrients such as grapefruit seed, citron, cucumber, wormwood, ginseng and green tea and many other plants. The product is packaged in a white circular container and is printed in gold. The three color scheme of gold, black, and white are simple yet classy. I also love the aesthetics of this product, it’s not too thick nor thin and has a gold shimmer. In addition, there is a small plastic spatula on the top of the container. I actually love the scent of this product, but it is stronger than most. If you have sensitive skin or are sensitive to smell, you may not like it. If you are an insomniac like me and have to go to work all day, my eyes get very puffy and just look tired in general. After putting this product under my eyes for about 20 minutes I feel as though I’ve been totally refreshed. It de-puffs the skin around my eyes as well as giving it a cooling sensation. 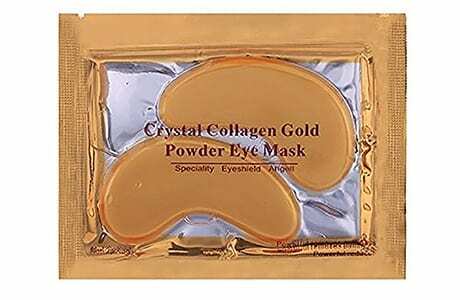 When you use the Gold Black Pearl Hydrogel eye mask you can tell it’s not cheap but is made from high-quality ingredients. Unlike other eye patches that I have used, the eye area does feel a bit tighter after using this product (perhaps this is due to all its extra special ingredients as well as the firmness of the patches). The Korean Gold Nano Particle Eye Hydrogel Patches contain “particles split diluted colloidal by the action of ions” which gives your skin nutrition, hydration, and moisture for tired, dry, puffy eyes. This is an innovative way to keep your under eyes looking young and rejuvenated . It is also filled with natural plant collagen. Unlike many other Korean products that have directions written in Korean, this eye patch has been translated to English. I absolutely love these products but many times I don’t know if I’m applying the product correctly. I love how there is a spatula to separate them so you do not have to use your fingers. The packaging is super clean and cute; the box and plastic are a light pink and the lettering is a golden brown. When opening the container the patches are yellow and the spatula is placed in the box. It contains a lot of essence so be careful when opening the container. If you have sensitive skin this product can sting your skin, so test it before doing the whole treatment. Although I recommend this product, because of all the essence in the container it tends to slip down when applying it on my face. I had to lay down and apply the eye patch, where with others I could place them under my eyes and walk around. Other than that this product does work well, but don’t expect great changes during the first or even second use. If you’ve had a long night of partying and want to look well rested then this product is something you should definitely look into. Petitfee’s Premium Gold & EGF Eye Patch is known for its extreme firming properties, nutrition, and hydration without drying your skin. They are firm jelly-like patches that are soft and firm. This product has a jelly like consistency but isn’t too thick like other eyepatches. Because of this, it does not slip off my face. I’m constantly running around my house cleaning or on the computer, therefore it’s great that I can kill two birds with one stone. It is translucent and has a slight yellow tint to it giving it a very clean appearance. When you wake up just put this patch on under your eyes and go ahead with your morning routine. Keep it on for 15-25 minutes and nobody will be able to tell you partied the night before. The puffiness and tired eyes will disappear and you will look like you slept for eight hours. I especially love this product because it will revitalize your eyes temporarily in such a short period of time. It gives your eyes a soothing effect that will also wake you up in the morning! For a jelly product, it is very light yet does the same thing as other eye patches that are more expensive and heavier. 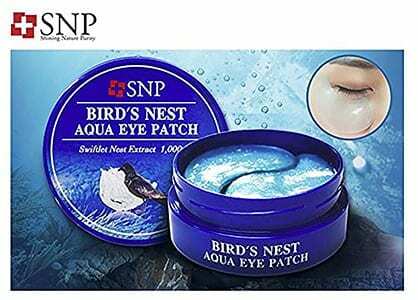 The Bird’s Nest Aqua Eye Patch comes with 60 pieces that moisturize, cool, soothe and gives elasticity. This eye patch is concentrated with hyaluronic acid, aloe vera leaf, cabbage rose, green tea and citron extract. These ingredients clarify your skin, gives skin resilience and tightens pores. In addition, it also cools and calms your skin! The hydrogel consists of a blue, jelly-like material that contains glitter which I always love. The hydrogel material keeps the patch sticking to my eye much better than other cotton patches. Many times when I pull other patches off, there is a flaky and sticky feeling but this product does not do that in the least. I just feel refreshed and my eyes have a notable difference. Visually, the blue/turquoise/white gives a cool effect to the whole product. The consistency of these patches are amazing, it’s super soft, and there’s a perfect amount of essence in the container. The only thing that bothered me was that there wasn’t a spatula to separate the eye patches. It’s pretty difficult to separate the thin pieces and I feel as though I’m getting it dirty. I had a couple blemishes under my eyes and when I used the aqua eye patch they slowly disappeared after the second use. The other feature that I enjoyed was how cooling it made my eyes feel. I had put it in the refrigerator but it had the same cooling effect which I haven’t found in other eye patches. Let’s face it, we all party and stay up a little too late even though we know we have to get up early for work the next day. Well, this eye patch is perfect for that kind of morning. 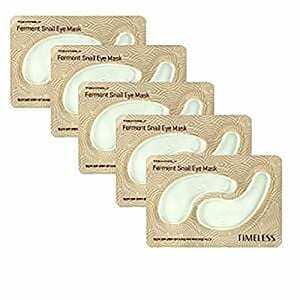 The Tonymoly Timeless Ferment Snail Eye Mask is infused with a snail secretion that has been a much-hyped ingredient lately. You may not know this, but snail secretion is very moisturizing and provides nutrition. The fermented snail extract gives your dry skin a smooth healthy makeover. Filled with hyaluronic acid, aloe, rose extract and colloidal gold, these ingredients help the Tonymoly patches provide cooling nourishment for your eyes. What I really enjoyed about these patches was that they actually fit underneath my eyes. Many of the other products that I have used have been too large or too small for my eyes. These patches have a clear jelly-like consistency, much thicker than most. Due to its high alcohol content, it could have a stinging effect if you have sensitive skin. Although I could feel the nutrients transferring into my skin, the only problem was it kept slipping down my face when I would stand up. 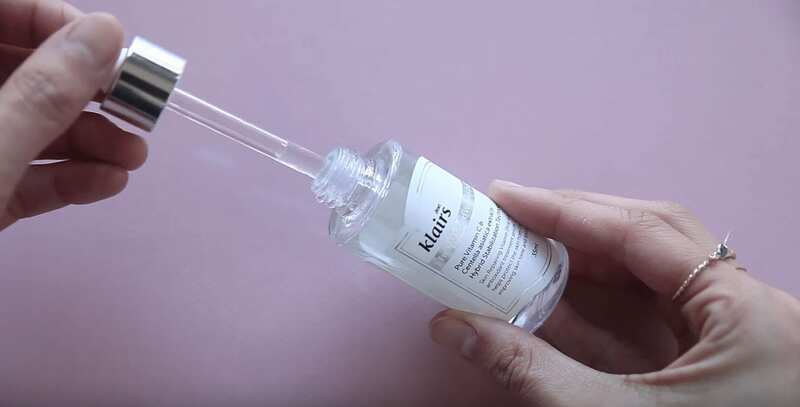 There are so many damn ingredients in Korean beauty products but what do they all mean? 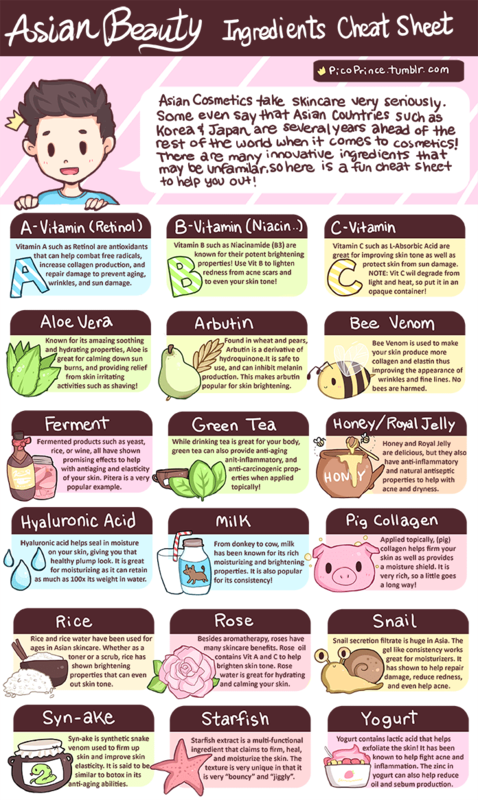 From starfish to snail extract, this handy little guide is the perfect cheat sheet to guide you while you shop for Korean beauty products! 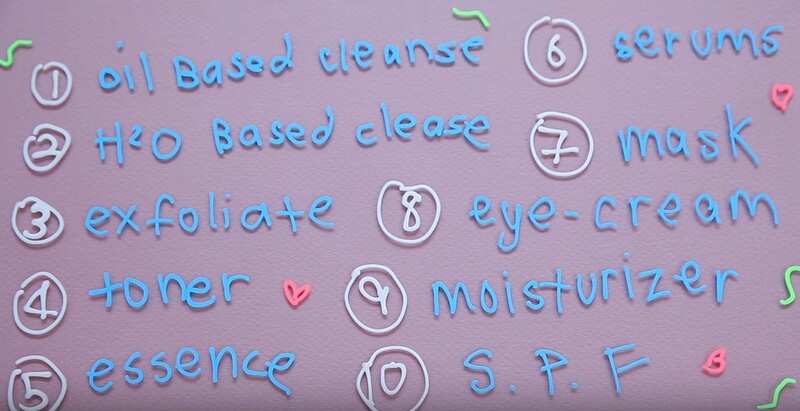 We are pretty obsessed with the 10-step Korean skin care routine. It seems super scary and daunting! 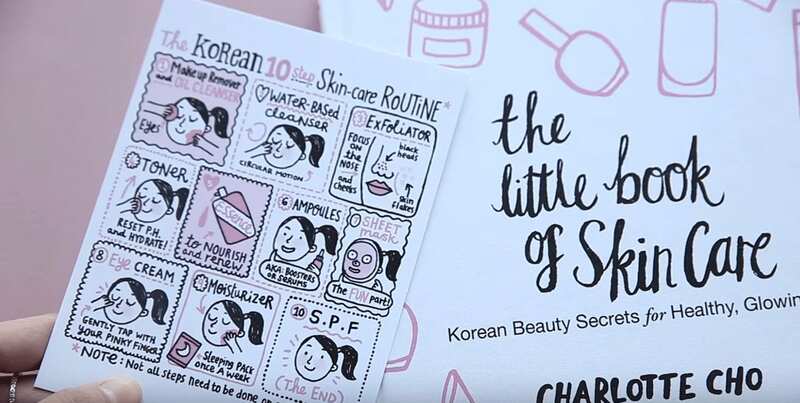 Youtuber Rachel Nguyen shot a great video about her recommended 10 step routine inspired by the book The Little Book of Skin Care: Korean Beauty Secrets for Healthy, Glowing Skin by Charlotte Cho from Soko Glam. 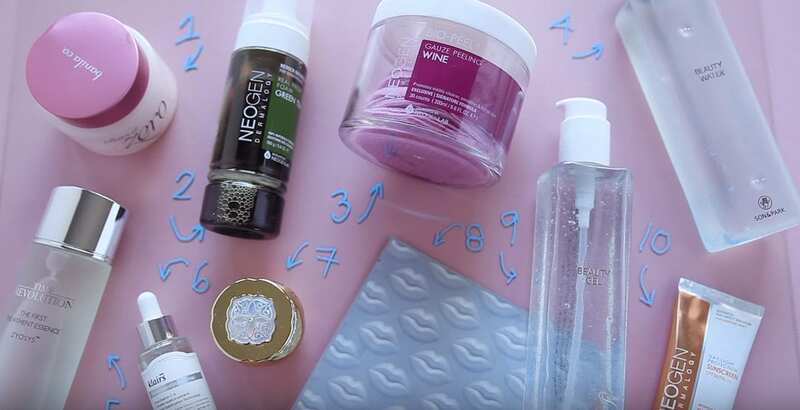 Rachel tried out this 10 step Korean beauty routine for several months and totally sees a huge improvement! She fell in love with all of the products. Of course we’ll be adding korean eye patches to this routine, making it an 11 step beauty routine. Here’s what all the products look like below. One of the most notable parts of the Korean skincare routine is the double cleansing, beginning with the oil based cleanser. Here she uses Banila Clean It Zero Sherbet Cleanser. It looks like a moisturizer but it totally melts off all the makeup. You put it on dry and then add warm water and just wash it off. Your skin is quite clean after using the Banila Cleanser! 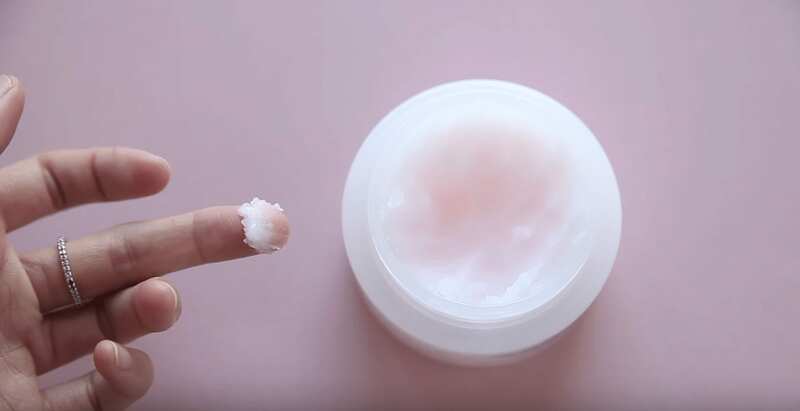 Rachel also recommends the Clinique – Take the Day Off cleansing balm if you prefer a trusted American version of the product. Next up is the water-based cleanser. At first, cleansing twice might seem like overkill, especially if the first cleanser does such a good job already. Well, the oil based cleanser cleans off all the oil and the dirt but there is still some residue. The water cleanser will definitely get rid of everything! 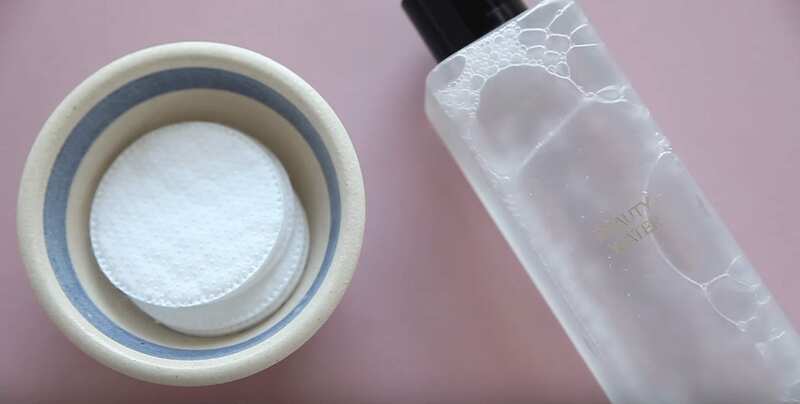 This water-based cleanser is more of the traditional foaming cleanser. It even has green tea leaves at the bottom of it. We love that! The NEOGEN Green Tea Foam Cleanser is not stripping, naturally brewed and it smells great. 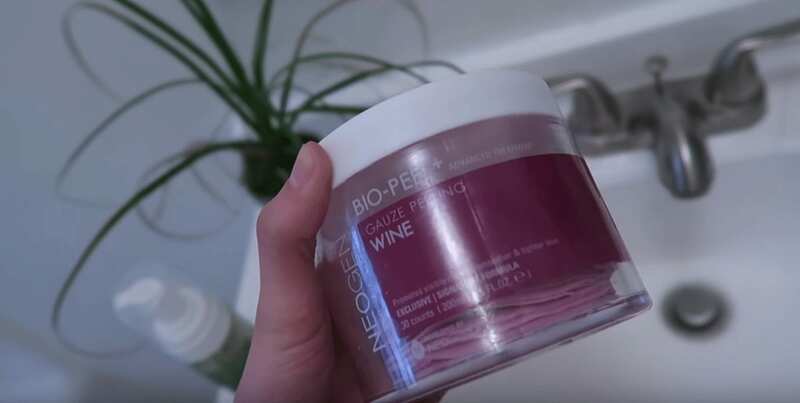 Next up is exfoliation using Neogen’s Dermalogy Bio-Peel Gauze Peeling Wine. The book recommends a mechanical exfoliator or a chemical one. A mechanical one is more physically abrasive like a sugar scrub, whereas a chemical exfoliator uses ingredients such as lactic acid. You only have to do this step once or twice a week. We love how this comes in individual exfoliating pads. They are soaked in acid. The Neogen is a cross between both mechanical and chemical exfoliation. Next up is toner using Son & Park Beauty Water. We love the super clean packaging! In Korea, the toners are much more hydrating than they are astringent. This product is super refreshing. Step 5 is Essence. What does that mean?! Here Rachel uses Missha Time Revolution. Essences are the heart of the Korean 10-step Beauty Routine. They help hydrate and increase cell turnover. Rachel calls this a holy grail item. Are we only on Step 7?! Step 7 is the Sheet Mask. The once Rachel uses in the video is a bit different than the ones that I have tried. It’s a two-piece mask from Mannefit. This is a gel based mask. There are endless choices of Korean Masks that you could use for this step. This eye cream has beautiful packaging which we always appreciate! The Missha Gumsul Giyoon Eye Cream is super thick and super hydrating. Step 9 is the last step if this is your nightly routine. Yes! Finally!! Here she uses Son & Park Beauty Gel. I’ve never used a beauty gel before so this was fun and it felt super refreshing. This is the most important part of your nighttime skincare routine. This book recommends that once a week you substitute your moisturizer with a sleeping mask or a night cream. You’re done! Unless this is your daytime routine. If so, you’ll be on your last step, step 10! This is the most important step in your daytime skincare routine, which is wear SPF, always! Sun is the ultimate skin ager, so make sure to protect that precious skin!